May’s speech followed a meeting of the National Security Council to discuss Britain’s response to the poisoning of Skripal and his daughter, Yulia, just over a week ago. “It is now clear that Mr Skripal and his daughter were poisoned with a military-grade nerve agent of a type developed by Russia. This is part of a group of nerve agents known as Novichok,” May claimed. 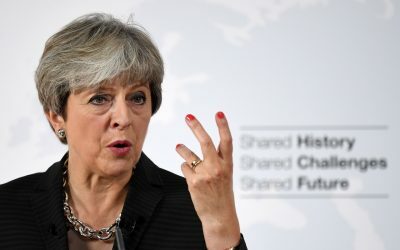 Her speech follows a wave of anti-Russia hysteria unleashed by the media, political and military establishment, including the mobilisation of 180 military personnel in the cathedral city of Salisbury. The May government’s reckless actions are dragging the UK to the brink of war with Russia. She framed her stance as a response to “a well-established pattern of Russian State aggression” throughout Europe and in the Middle East. “Russia’s illegal annexation of Crimea was the first time since the Second World War that one sovereign nation has forcibly taken territory from another in Europe,” she declared. Just hours before May’s speech, Rear Admiral Alex Burton, former commander of the UK’s Maritime Forces, who also commanded NATO’s “high readiness” naval forces, said Britain was threatened with losing its status as a “credible military power.” Citing the threat from Russia, he called for a major boost in military spending to at least 2.5 percent of GDP—an extra £7.7 billion a year. May’s remarks will have been drafted in the closest collaboration with powerful sections of the military and political establishment in the United States, centred on the Democratic Party, who have been pushing for a confrontation with Russia against a degree of resistance from the Trump administration. In response, last week US Director of National Intelligence Dan Coats told a Senate armed services committee hearing he had not seen evidence of Russia trying to meddle in the 2018 midterm elections, but that it is “highly likely” Moscow will try to do so. He expected the US Treasury to announce sanctions on Russia as soon as this week. Treasury Secretary Steven Mnuchin made a similar announcement, insisting that Trump is “fully supportive” of the actions. That same day, the European Union said it had extended sanctions against Russia, imposed following Russia’s annexation of Crimea, for another six months. Responding to May, Labour leader Jeremy Corbyn said the whole house condemned the “deeply alarming attack” in Salisbury and that a full account was needed from Russian authorities. His diplomatic caveat met with cries of “shame!” and “disgrace!” from the Tories and was too much for the warmongers in his own party. Former shadow transport minister John Woodcock, who has previously stated he could not support Corbyn as prime minister, suggested that the Labour leader in Number 10 would threaten the UK’s national security.